In his now-classic work The Myth of the Rational Voter, Bryan Caplan identifies four systematic biases about economics held by the average citizen: make-work bias (an inclination to overestimate the disadvantages of temporary job destruction due to productivity increases), anti-market bias (a tendency to overlook the benefits of the market as a coordination mechanism), pessimistic bias (an inclination to underestimate the present and future performance of the economy), and anti-foreign bias (a tendency to underestimate the economic benefits of interaction with foreigners). Widespread biases on economics are far from being harmless. Wrong ideas held by voters usually lead to catastrophic policies due to the inherent nature of the democratic process. In other words, in most cases, politicians undertake those policies that they deem popular among voters in order to get reelected. If those policies beget pernicious consequences for the economy, harmless beliefs turn into lower living standards for all. Of those four biases, the most potentially harmful is the anti-foreign bias. This inclination to underestimate the benefits of economic cooperation with foreigners manifests itself politically in two main ways: protectionism and anti-immigration policies. Despite the recent surge of protectionism in some developed countries, free trade is now the rule rather than the exception in most parts of the world. However, when it comes to immigration, only a few steps have been taken worldwide over the last few decades in a direction of liberalization (even though the consensus about the benefits of more open borders in the economics profession is probably as strong as the consensus around free trade). As I will show in this series of two articles [see the second article here], anti-immigration policies reduce the well-being of both potential immigrants and host societies, as shown by economic theory and empirical evidence. Or, to put it differently: even a partial liberalization of immigration restrictions would, in the long-term, contribute to improving the standards of living globally. The economic case against less restrictive immigration policies rests on shaky pillars. The most common anti-immigration arguments are related to the supposedly negative effects that immigration has on the host country’s labor market, and, more specifically, its impact on employment and wages. According to advocates of immigration restrictions, immigrants do not only take natives’ jobs, but also have a depressive effect on wages. However, economic theory does not support these assertions. First, the economy is not a zero-sum game: the numbers of jobs available is not finite. As pointed out by Alex Tabarrok (here and here), immigrants are not only producers but also consumers, which implies that an increase in demand triggered by the expansion of the immigrant population goes hand in hand with an increase in total employment. Also – and contrary to conventional wisdom – not only highly-qualified immigrants create positive externalities on host economies. Low-skilled immigrants tend to take lower-productivity jobs (as they often either lack higher education or do not speak the language), allowing the native-born to access higher-productivity jobs (assuming free trade and a flexible labor market). All said above can be also applied to wages. All else equal, the law of supply and demand says that an increase in the supply of labor would inevitably cause lower wages. However, more immigrants also mean a higher demand for goods and services, which in turn results in a higher demand for labor, preventing a generalized decrease in salaries. Even in those cases when wages in a particular sector are temporarily pushed down, lower wages lead to lower costs for companies, which usually results in lower prices for consumers due to the process of competition. Immigration-friendly policies can also help tackle the demographic problem that many developed countries have been experiencing over the last years. For instance, the progressive demographic ageing of the American population is already having an impact on the US Social Security system. According to the Population Reference Bureau, the number of Americans over 65 years old will have moved from 15% in 2014 to 24% of the population by 2060. As a result, the worker-to-beneficiary ratio will decrease by 32%, from 3.4 in 1990 to 2.3 in 2030. This problem could be mitigated by adopting a more flexible immigration policy that increases the working population, reversing the trend that will otherwise end up with significant spending cuts in Social Security benefits. The discussion so far has focused on the benefits of immigration for receptor countries. How do the sending countries and immigrants benefit from the migratory phenomenon? Immigrants usually transfer part of their income to their countries of origin with the aim of economically supporting their families and friends. These so-called remittances are flows of capital from developed to developing countries which assist in the economic development of sending countries. The main beneficiaries of eliminating barriers to labor mobility would be, no doubt, immigrants themselves. This is due to the concept of Place Premium. This concept, first introduced by Michael Clemens, Claudio E. Montenegro, and Lant Pritchettin in a 2008 paper, refers to the automatic increase in earnings (PPP adjusted) that a worker experiences by moving from a low-productivity country to a high-productivity country, without increasing the worker’s human capital. The factors behind this phenomenon are multiple: differences in capital accumulation, quality of infrastructures, technology, proximity to high-productive workers, different legal frameworks, etc. The empirical evidence (which will be dealt with in the second and final article of this series) shows that wage differences among countries due to Place Premium are immense. The corollary is simple: more open borders would bring about a substantial reduction in poverty levels across the world. What would happen if migration barriers were partially or totally eliminated on a global scale? In his paper Economics and Immigration: Trillion-Dollar Bills on the Sidewalk, Michael Clemens, senior fellow at the Center for Global Development, reviews the academic literature on the topic. If all barriers to labor mobility were to be removed, world GDP would increase in the range of 50% to 150%. Even partial liberalizations would bring about considerable gains. For instance, a reform that allowed 7% of the population to emigrate to higher-productivity countries would result in an efficiency gain of 10% of world GDP. 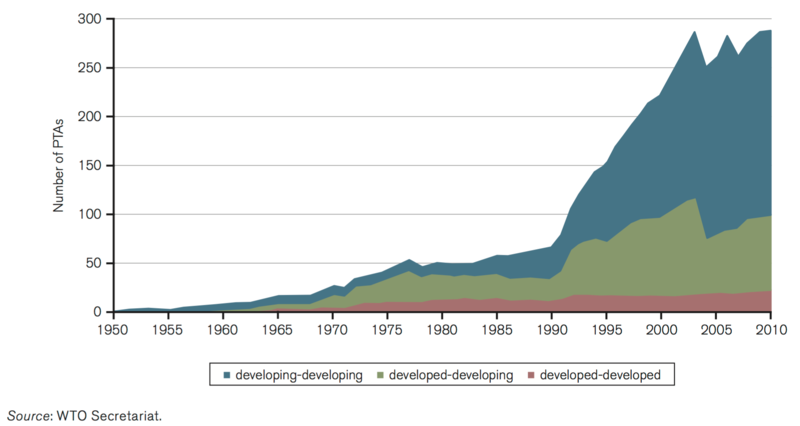 To put this into perspective, if all remaining trade barriers were eliminated, world GDP would grow by just 2% or 3%. As shown, the impact of relaxing migration barriers on the world economy would be extremely positive, especially for the poorest segments of population. The theoretical analysis above clearly supports the adoption of more immigration-friendly policies as a way of increasing economic growth and improving the welfare of millions and millions of people, including those in receptor countries. However, economic theory needs to be supported by facts. In my next article, I will provide empirical evidence in support of eliminating barriers to immigration. Luis Pablo de la Horra is a Spanish finance graduate from Vlerick Business School. Fans of J.R.R. Tolkien’s trilogy The Lord of the Rings (LOTR) have long been aware of a possible plot hole. The central narrative concerns the hero, Frodo Baggins, who must destroy a powerful ring by walking through forbidding terrain and defeating or eluding monstrous foes and throwing the ring into a live volcano. The journey takes many months and costs Frodo and his companions dearly. Anyway, it occurred to me that the kind of social theory that I and many Austrian economists engage in could usefully be framed in terms of plot holes. I’ll define a plot hole as a failure of logic, a factual mistake, or an obvious solution to a critical problem central to a story. (Here’s a slightly different definition from Wikipedia.) Of course, any particular plot hole may involve more than one of these errors of fact, logic, or perception, and there may be more kinds of plot holes than these. But here are examples of each of the ones I’ve mentioned. They come from movies, but some of them, such as the plot hole in Lord of the Rings, have literary counterparts. Factual hole: In the movie Independence Day, key characters survive a massive fireball by ducking into the open side-door of a tunnel just as the inferno blasts by. Anyone who knows about firestorms would tell you that the super-heated air alone would instantly kill anyone in that situation. Logical hole: In Citizen Kane, miserable Charles Foster Kane dies alone. How then does anyone know that his last word was “Rosebud”? Keep in mind that it’s a reporter’s search for the meaning of that word that drives the story forward. Perceptual hole: The LOTR problem mentioned above is an example of this. No one seems to realize that there may be a much safer and effective way to defeat the enemy. I would think that one of the things that makes writing fiction difficult is that events and characters have to hang together. The writer needs always to keep in mind the rules of the universe she’s creating, to recall what her characters know and when they know it, and to make sure that these details all constrain every action and event. In real life, we make mistakes all the time. I think it’s interesting that those mistakes appear to fit neatly into the three categories of plot holes I’ve identified. Factual hole/error: A person who doesn’t know the difference between liters and gallons buys a 100-liter barrel to hold 100 gallons of rainwater. No explanation necessary. Perceptual hole/error: Selling your car for $15,000 when, unbeknownst to you, you could have sold it for $20,000. The better deal simply escapes your notice and, if you were ever to learn about it, you would feel regret. Here’s the difference though: In fiction, a writer can get away with any of these three plot holes as long as no reader sees it. Even if you do notice one, but you otherwise enjoy the story, you might be willing to overlook it. But in real life, you can’t ignore factual or logical plot holes. If you try to, they will come back and bite you. It will be painfully obvious that you can’t put 100 gallons of water into a 100-liter barrel. And if you bet on your next investment being a winner because you’ve just had a bunch of losers, it’s very likely that you’ll be disappointed. These kinds of holes you’re bound to discover. I wrote about errors in an earlier column, but the distinction comes from my great teacher Israel Kirzner. He identifies a class of errors that derive from “overoptimism.” The more optimistic you are, the more likely it is that you’ll deliberately pass up solid opportunities for gain and thus the more likely it is that you’ll be disappointed. That’s not to say that optimism is a bad thing. If you weren’t optimistic and so never acted on that optimism, you’d never know if that optimism were warranted or not. You would never learn. The other kind of error, what Kirzner calls “overpessimism,” happens when you’re so pessimistic that you unwittingly pass up a realizable opportunity. And because you don’t take chances, you don’t learn. This type of error is akin to a perceptual hole. Thinking you can only get $15,000 for your car means not selling to someone who would in fact pay more. Here, it’s not inevitable that you will discover your error because, after all, someone does buy your car (for $15,000). But you could have done better if you’d been more alert. So errors of overpessimism, what I’m calling perceptual holes, are very different from factual and logical holes in that they are much harder to detect. For many Austrian economists like me, economics, as a branch of a social theory, accepts as a datum that people are prone to make mistakes. But given the right rules of the game—private property, free association—they can discover those mistakes and correct them via an entrepreneurial-competitive process. Unlike plot holes in fiction writing, then, plot holes in living social systems are a feature, not a bug. So our challenge as flesh-and-blood people, and what makes our lives interesting, is to discover plot holes, especially perceptual ones, and to fill them in. The challenge of social theorists is to understand as much we can about how that happens. In novels it’s the people outside the story who discover holes; in society it’s the people living the story who do. Plot holes in novels spell failure. Plot holes in real life mean opportunity. I have a pretty positive view of human nature, for a number of reasons. Partly, I’m consciously correcting for the negative bias of “if it bleeds, it leads” journalism. I also reject the idea that being self-interested is necessarily anti-social. Pursuing your own happiness, rightly understood, is a good thing. In fact, I would argue that those who care little for loftier goals like the good of society often do more good than do-gooders, as long as they pursue their self-interest rationally. But caring about others is also a good thing, of course. And nobody cares more than those activists, pundits, political leaders, and enthusiastic voters who are involved in fighting to bring about a better society, right? Well, not according to philosopher Michael Huemer. In a very readable and thought-provoking paper entitled “In Praise of Passivity,” Huemer suggests that most people who see themselves as motivated by some high political ideal are instead motivated “by a desire to perceive themselves as working for the noble ideal.”How can you tell who really cares? This requires, among other things, reading up on more than one side of a controversial issue. Huemer doesn’t think most people with strong political opinions do these kinds of things. Rather, according to his observations, “most people who expend a great deal of effort promoting political causes expend very little effort attempting to make sure their beliefs are correct. They tend to hold very strong beliefs that they are very reluctant to reconsider.”This tendency certainly counts against my positive view of human nature. Given how difficult it is to acquire real knowledge in the social sciences—something Huemer explores in his paper—people who merely want to perceive themselves as working for high political ideals are very likely to do more harm than good. But all is not lost. For one thing, I ascribe no ill will to people who want to feel good about themselves. And fortunately, there are workarounds for our all-too-human cognitive biases. Huemer has several recommendations for how to do some real good (and avoid doing real harm) in the world, recommendations that will surely challenge many people’s assumptions — which is itself a good thing.